This is reportedly the first known time someone from Trump's inner circle has been issued a grand jury subpoena in Mueller's investigation. 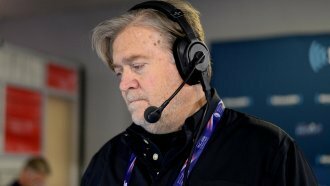 Special counsel Robert Mueller reportedly subpoenaed former White House chief strategist Steve Bannon to testify before a grand jury. Mueller's been investigating Russian meddling in the 2016 presidential election for months. The New York Times reports this is the first known instance that someone from President Donald Trump's inner circle has been subpoenaed to testify in front of a grand jury in Mueller's investigation. The Times noted, "It was not clear why Mr. Mueller treated Mr. Bannon differently than the dozen administration officials who were interviewed in the final months of last year and were never served with a subpoena." Mueller reportedly issued the subpoena after comments attributed to Bannon were used in Michael Wolff's book "Fire and Fury: Inside the Trump White House." According to the book, Bannon criticized the 2016 Trump Tower meeting involving campaign officials, Donald Trump Jr. and some Russians — calling it "treasonous" and "unpatriotic." News of the subpoena broke Tuesday — the same day Bannon testified behind closed doors before the House Intelligence Committee, which is also investigating Russian meddling and potential links to the Trump team.